This tasty prime rib recipe is herb crusted and served with horseradish butter. It's easy to make the prime rib, as long as you follow a couple of basic techniques. 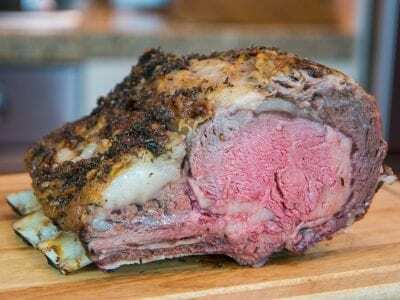 This prime rib recipe is a family favorite and always a holiday hit on the FlavCity YouTube channel. It’s perfect for feeding 10-12 people and could not be any easier to make. You just need to follow a couple techniques and you will roast the best prime rib roast ever. 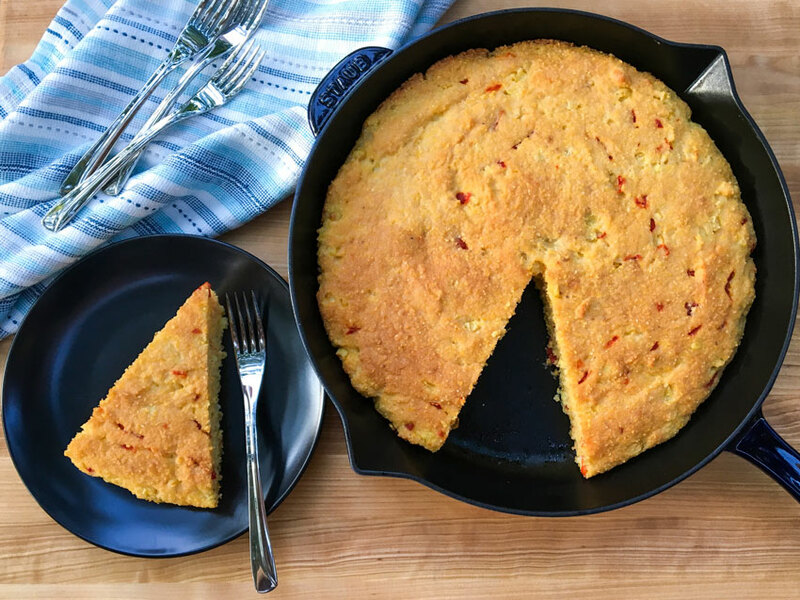 If you need some side dishes for your holiday table, try my ultimate creamy mashed potatoes and my skillet cornbread. The first thing you need to do is buy a 8-10 pound high quality prime rib roast from the store. You can buy boneless or bone-on, but keep in mind boneless is a bit easier to make. Season the prime rib with salt, pepper, and herbs and allow it to sit uncovered in the fridge over night. This will help the meat marinate and the salt will bring some moisture to the surface and get infused with the herbs. When it is time to cook the prime rib, make sure to let it sit at room temperature for 1.5-2 hours. If you put a cold prime rib in the oven, it will cook unevenly and be tough. It is completely safe to allow the meat to sit out that long. Once the prime rib goes into a 325 degree F oven, insert a digital probe thermometer into the deepest part of the meat and keep it in there while the prime rib cooks. This will allow you to monitor and pull the prime rib from the oven when it hits 120 degrees F for medium-rare. Otherwise it is too hard to know when the meat is done and you will most likely overcook it. Once the prime rib comes out of the oven, loosely cover it with tin foil and allow it to rest for 35-45 minutes. If you cut into the meat too soon, the juices will run out and the prime rib will get dry. 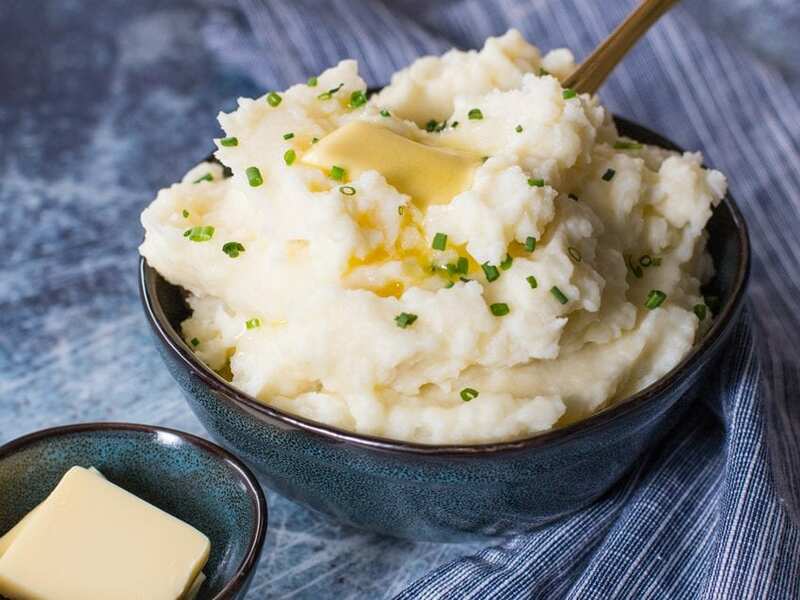 While the prime rib is cooking in the oven, make the herb butter by combining 1 stick of room temperature butter with fresh or prepared horseradish, grated garlic, lemon zest, and herbs. This can be made ahead of time and once the prime rib is sliced, dollop some of the butter on top and enjoy! 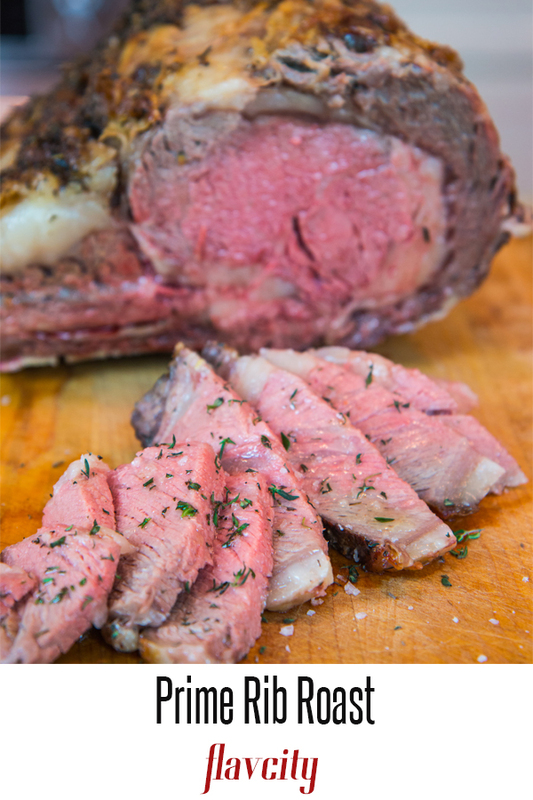 This prime rib recipe is easy to make and perfect for the holidays. Herb crusted prime rib with horseradish butter. Rub the prime rib all over with some veggie oil. Season both sides of the meat with an aggressive amount of salt, including the end caps. You want a generous amount all over so it helps form a crust while cooking. Continue seasoning with some pepper(not as much as the salt), and a good amount of fresh herbs all over the meat. Use a knife to cut slits of the top side(fat side) of the meat. Make the cuts just big enough to stuff the garlic cloves all around. Ideally, let the roast marinate uncovered overnight in the fridge. 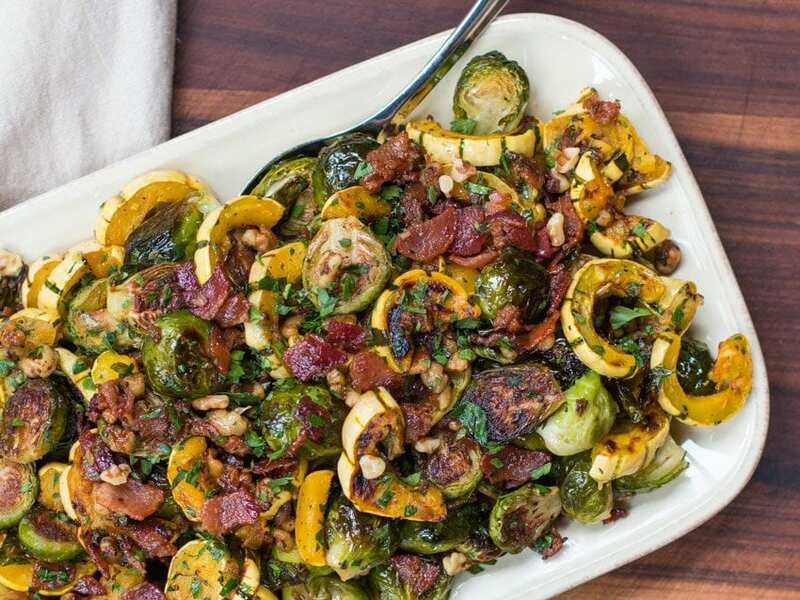 This will help infuse lots of flavor and help form a great crust. Alternatively, you could let the roast come up to room temperature for 1-1.5 hours with the seasoning on before you cook it. Pre-heat oven to 325 F and setup the oven rack so the roast will sit on the bottom rack. Put the prime rib on a roasting rack in a pan. Insert a probe thermometer in the deepest part of the meat(don’t touch the bones), and roast in the oven for 2.5 hours, or until the internal temperature reaches 130 F(120 F for medium rare). You may need to add 1 cup of water to the bottom of the roasting pan if the fat starts to smoke. While the meat is cooking, make the butter by adding all the ingredients to a bowl and mix well. Butter can be made ahead of time and stored in the fridge for 1 week. When the meat reaches 130 F, take it out of the oven and loosely cover it with tin foil. Let rest for 30-60 minutes so the juices can re-distribute. Slice the meat, top it with the butter and enjoy! Thank you, Rick! Glad you enjoyed! Great tips! Letting the meat come to room temperature by sitting for 2 hours is so important as well as those seasonings. I would add that if you don’t have fresh, use dried, especially thyme. Thyme makes a huge difference in meat flavor. I’ve heard that fresh horseradish, when grated, gives off powerful fumes, but it’s worth it for the intense flavor it brings. Can’t wait to try this. 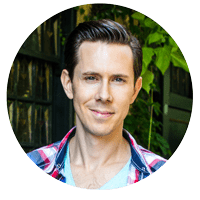 Website is very well done, thanks for all the information! Hey Celeste, glad to hear it! Yes, horseradish has a powerful flavor so you don’t need that much of it. What if my roast is 4.5 lbs — how long to cook? 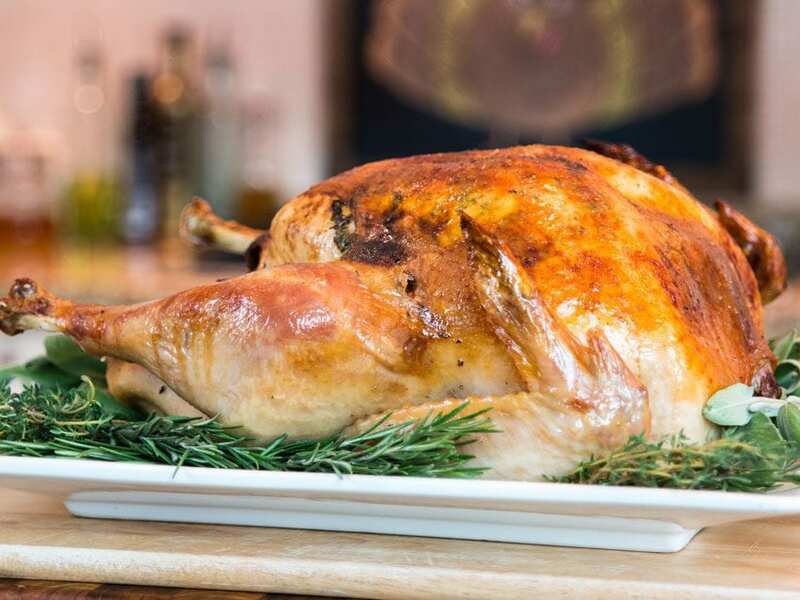 Generally it requires 20 minutes per pound, but a probe thermometer is a MUST to make sure you nail the temperature.